Background checks deliver valuable insights that lead to smarter, more informed decisions and greater security for businesses and consumers. For businesses, it is the foundation of due diligence. It provides the insight you need to reduce risk and improve profitability by helping you safeguard transactions, identify trustworthy customers and partners, hire qualified employees, or locate individuals for debt collections, law enforcement or other needs. For consumers, it’s an easy way to verify personal data, screen potential renters, nannies, doctors and other professionals, and discover any negative background information that could impact your employment eligibility. To help you successfully compete for and quickly onboard the right employees, we offer several screening solutions that make it easy to assess potential new hires. Leveraging comprehensive data solutions and industry leading technology, our employment background checks and screening tools help you instantly search billions of public and proprietary records to find the background information you need. With today’s challenging economic conditions, job applicants are facing fierce competition for fewer and fewer positions. 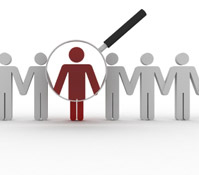 In this environment, personal background checks may provide the competitive advantage you need. By discovering the information potential employers will review about you, you can start to take control over your job search-often with better results.